A fun, interesting and visually wonderful look a little deeper into the world of the Ghostbusters. A lot of film guides are usually labelled ‘must-haves’ for fans of the films in question but, in our opinion, Back To The Future: The Ultimate Visual History actually is. 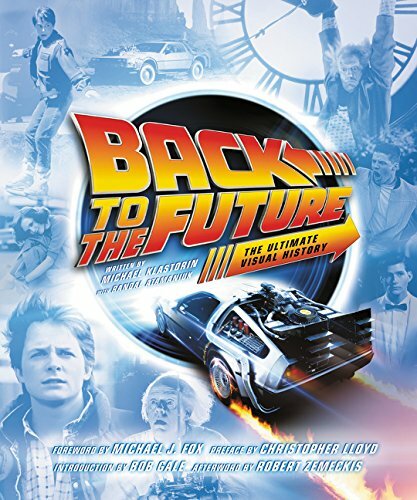 Made up of an equal combination of text and images, it takes us on an 88MPH journey through the making of the series, from the Enchantment Under the Sea dance to 2015 Hill Valley to Clayton Ravine in the Wild Wild West, with behind-the-scenes stories, sketches and thought processes. There’s even a scan of an original casting list for “the role of scientist”. We know you’re desperate for a peek at that. There’s even a charming foreword written by Michael J Fox (“Even I find this stuff fascinating and revelatory. Did you know they shot the first five weeks of Back To The Future with another actor in the lead role? Get outta town…”) and a hilarious preface from Christopher Lloyd (“After I read Back To The Future the first time, I threw the script in the trash…”), while producer Bob Gale and director Robert Zemeckis provide the introduction and afterward respectively. Additional pull-out goodies like a Jaws 19 theatrical poster, the photo of Marty and Doc with the clock face in 1885 and Marty’s handwritten letter to Doc warning him of his future death make the Ultimate Visual History an absolutely joy to browse through while reminiscing.